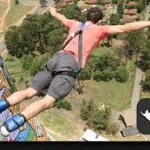 A guest at Liz at Lancaster had his adrenalin rush for the weekend when he went bungee jumping from the old cooling towers in Soweto. Known as the Orlando Towers, this ‘vertical adventure facility’ was the brainchild of Bob Woods back in 2001. When the disused towers needed maintenance the service of a rope access specialist was required and Bob was such a person. His idea was to build the first ever vertical adventure center in a cooling tower, offering swinging, bungee jumping, climbing , abseiling, rap jumping, a zip line and more. The suspension bridge spanning the two towers was subject to stringent engineering standards and testing procedures. On completion, it was hoisted into position 100m above the ground by means of a sophisticated hoisting system, purpose designed for the unique bridge. The bridge spanning the two towers was completed in August 2009, and the World’s First Bungee Jump between 2 Cooling Towers was performed on 5 September 2009, by Bob Woods himself. Sadly, Bob Woods passed away in a climbing accident on Table Mountain on 8 April 2010. The Orlando Power Station was constructed in three phases between 1939 and 1955. There was an increasing demand for power in Johannesburg during the 1930s. I’ve blogged before about power supply in Johannesburg. Initially at Orlando, the spray ponds in the dam were used to cool the steam from the boilers and it was only in 1951, when the power station was extended, that the two cooling towers were added as additional cooling mechanisms. The Orlando Power Station functioned until 1998, way beyond its intended lifespan. 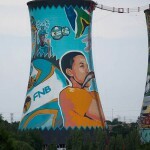 I just wish to find out, how much it cost for 2 people to jump from soweto 2 tower.